A former city employee in the Fukushima prefecture town of Koriyama has built a 4-meter (13-ft) long canoe from thousands of used disposable chopsticks recovered from the city hall cafeteria. Bothered that perfectly good wood was going to waste after a single use, Shuhei Ogawara -- whose job at city hall involved working with the local forestry industry -- spent the last two years of his career collecting used chopsticks from the cafeteria. An experienced canoe builder, Ogawara spent over 3 months gluing 7,382 chopsticks together into strips to form the canoe shell, to which he added a polyester resin coat. 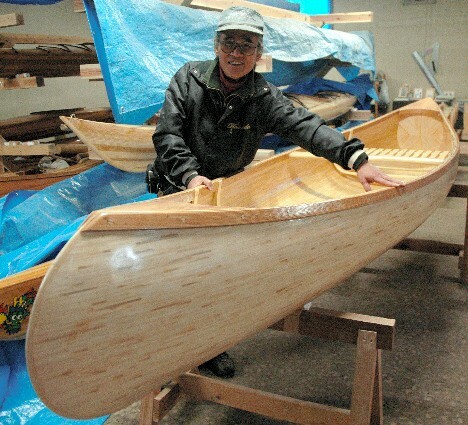 The canoe weighs about 30 kilograms (66 lbs), which is a bit heavier than an ordinary cedar canoe, but Ogawara is confident it will float. A launching ceremony is planned for May at nearby Lake Inawashiro. It is a nice idea to be worried about preventing the waste of waribashi�disposable chopsticks�millions of disposable chopsticks are thrown away after a single-use. However, the fact is that this canoe uses much MORE toxic petroleum resin to hold together all the recycled chopsticks than a regular strip-built canoe. The final the environmental load/damage of this Japanese eco-trash canoe is greater than just using strips of wood. What's a better use for "toxic petroleum resin" than holding all those chopsticks? Anyone else hungry besides me? Can't wait for the 747 fashioned from the paper wrappers. Expert on Canoes there Taro? and TPR too by the sounds of things?! Who cares about the environmental impact, Taro... However you put it, it's totally badass. Look...there's no way around the fact that what this man has done is amazing and of course the environment matters. It is pointless to be sarcastic about the importance of the environment. It is extremely ignorant to think the environment does not matter, but it is the responsibility of the toxin manufacturers and politicians to get these toxins out of circulation. I doubt anyone else is going to make a toxic canoe out of chopsticks. I agree Taro was missing the point, but saying the environment doesn't matter could lead to believing it and no one facing serious consequences of catastrophy will laugh when they or their family is suffering. Anyway I love this boat and our friend here is amazing for building it. All modern canoes made of wood have some form of resin or epoxy used to seal them. So no matter what kind of wood the boat is made of they are going to use something to seal it. Doubtful for this canoe to use any more resin than a cedar job made of similarly sized pieces. Thats not the point of the article though is it? Taking something people have thrown away, then making something out of it is the point here. Too many discarded chopsticks is my conclusion. Polyester resins are not petroleum resins. This canoe and this idea are excellent. C-MONSTER.net. » Blog Archive » The Digest. 04.08.08. Question du jour : un cano� fait avec 7.000 baguettes peut-il flotter ? - Gizmodo - Tant d'amour pour ces fabuleux nouveaux gadgets, c'est surnaturel.